Ghias, A.; Pou, J.; Agelidis, V.; Ciobotaru, M.
This paper presents a voltage balancing method for stacked multicell converters based on phase disposition pulse-width modulation. This method is based on minimizing a cost function to determine the optimum redundant state for capacitor voltage balance for each particular voltage level. The robustness of the proposed voltage balancing method is verified against static and dynamic unbalanced load conditions. Furthermore, a significant reduction in the switching frequencies of the power devices is achieved by using sawtooth carriers instead of standard triangular carriers without affecting the voltage balancing capability. Ghias, A. [et al.]. 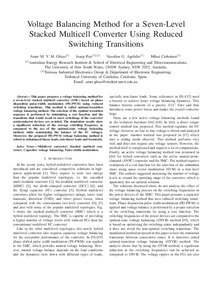 Voltage balancing method for a seven-level stacked multicell converter using minimum-switching transitions. A: Annual Conference of the IEEE Industrial Electronics Society. "IECON 2013 - 39th Annual Conference of the IEEE Industrial Electronics Society". Vienna: 2013, p. 6328-6333.